Shares are getting slammed after management issued disappointing guidance. Shares of NeoGenomics (NASDAQ:NEO) fell by 10% as of 12:00 p.m. EDT on Wednesday after the provider of cancer genetic testing services reported first-quarter earnings. Revenue rose by 3% to $61.7 million. By contrast, Wall Street was only expecting $61.4 million. Digging into revenue growth, testing volume grew by 15% year over year, but revenue per clinical genetic test decreased by 9%. Management said the decline was caused by rapid growth in the company's lower-priced immunohistochemistry tests. GAAP net loss was $0.04 per share. However, non-GAAP earnings -- which adjusted for non-recurring costs and amortization -- came in at $0.03. That matched consensus analyst expectations. Second-quarter revenue is expected to land between $62 million to $64 million. That's quite a bit shy of the $66 million in revenue that Wall Street was expecting. Second-quarter non-GAAP EPS range is $0.03 and $0.04, the high end of which matches expectations. Full-year 2017 revenue range was reduced from $260 million to $2775 million down to $255 million to $265 million. For comparison, Wall Street was looking for $264 million. Full-year 2017 non-GAAP EPS range was cut back by a penny to $0.17 to $0.21. Traders reacted harshly to the dialed-back forecast, hence shares are tumbling today. While today's drop is unpleasant, NeoGenomics' management team did its best to remind shareholders that its long-term picture is looking bright. Specifically, the company stated that it has finally completed all its integration activities related to its Clarient acquisition, which should allow for profit growth in the back half of 2016. Its pharma services division also reported a $41.5 million backlog at the end of the quarter, which shows that the company's testing services remain in demand. Finally, its new lab in Switzerland is scheduled to open in the third quarter, which will allow it to start marketing its services in Europe. Given all of the above, NeoGenomics looks poised to continue its recent history of rapid revenue growth. 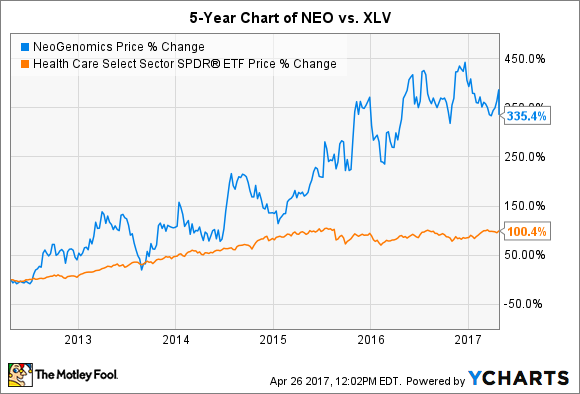 If true, then it is possible that its stock will continue to vastly outperform the healthcare sector in general as measured by the Health Care Select SPDR ETF (NYSEMKT:XLV). All in all, NeoGenomics seems positioned for growth even though its short-term results might be disappointing. If you are a believer in this company's long-term potential, then you might want to look at today's drop as an opportunity to get in.